This title deals with the funding of non-governmental organizations (NGOs) by international organizations, and the joint projects undertaken by the two. 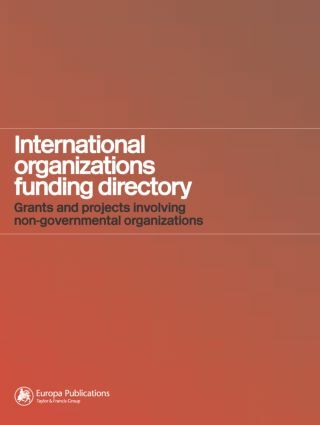 The International Organizations Funding Directory is an invaluable guide to the booming third sector, as well as a record of the undertakings of the major international organizations. Each major international organization is profiled in its own chapter, where its subordinate sections, institutions, departments and directorates will feature, along with the projects they run in partnership with important local, national or international NGOs. Projects included are those run in collaboration with local, national or international NGOs, which are influential on a national or international scale. Projects are included in any area of NGO activity, including: development aid; rural development; environment and conservation; women's empowerment; civil society promotion; medicine and health; culture and art; economic reform; education and human rights. Each entry, where relevant, includes information on the following: name and aims of the organization, department or project; activities; geographical area of activity; financial information (grants disbursed); restrictions (e.g. project run in certain area, no grants to individuals, grants made through a specific NGO, etc. ); how to apply for funding; publications; and principal staff. These details are supplemented by full contact details, including internet and e-mail addresses. In addition, the directory contains comprehensive index sections detailing the geographical area covered by projects, and the type of activity funded.